The first thing that hits you when you see the book is the size – it’s big! And it has to be with the quality of photos on offer, they are superb. A mix of on-track action, behind the scenes with factory riders and a fan’s perspective, all angles are covered through Roddy Macleod’s lens of the most prestigious motocross championship in the world, MXGP. The sheer contrast in tracks in the world championship is what really stands out visually in this book, with possibly my favourite photo from Arco as Davy Pootjes slides the rear end out on pure rock that has come through under the soil out of an uphill off-camber corner. Throttle-control is paramount as the difficult balance of mixing patience with the desire to go faster is caught in one frame. A few pages later the riders are suffering in the deep sand and heat of Lommel with a picture of Tommy Searle, exhaustion written all over his face, telling the story of the mental and physical trauma placed upon the minds and bodies of world class riders who willingly endure such a gruelling weekend to achieve their dreams and goals. But this book has even more than imposing photography, it has five of the best in-depth interviews you will read with Stefan Everts, Harry Everts, Joel Smets, Dave Thorpe and Gordon Crockard. Stefan Everts reveals why one title was never enough for him and why Jeffrey Herlings, “a machine,” uses an incredible amount of training to give him confidence. The single-minded Everts talks on a number of topics and you see why his honest and hard working approach along with his talent, have made him the greatest motocross rider of all time. Stefan’s dad, Harry, remembers the intense pain of having multiple operations as a child on his leg because of polio and the ensuing extraordinary fighting spirit that took him to four world titles and the strict father of a ten-time world champion. Five-time world champ Joel Smets discusses his late start to racing and what he had to do to make it, plus his natural born desire to win at everything. Britain’s greatest, Dave Thorpe, reveals the strategy behind his three world 500cc titles while an entertaining Gordon Crockard, three-time British champion and Grand Prix winner, uses his logical mind to discuss life and racing. 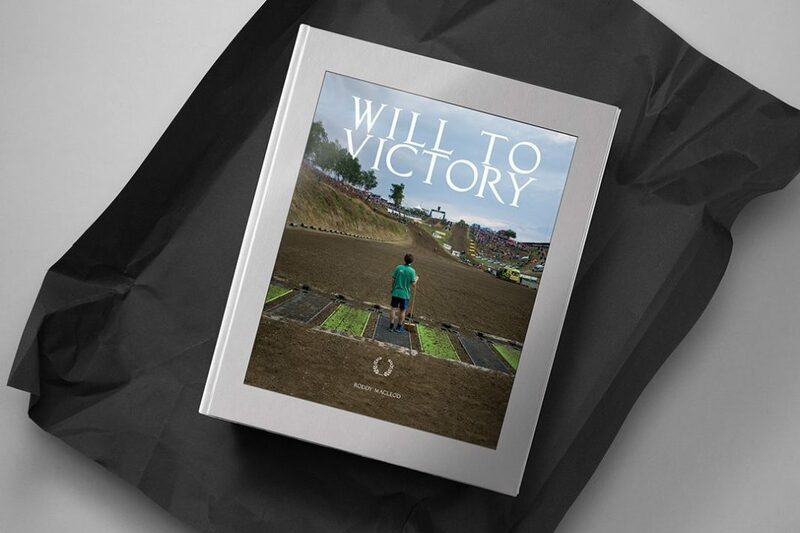 It is without doubt a unique and special book that combines the present colour, charisma and challenges of MXGP with its current superstars Herlings, Cairoli, and Prado alongside the words from legendary champions that laid the foundations and built the history of the world championship into what it is today. Roddy MacLeod has done a superb job with this book, it is a must have for any motocross fan and most definitely a collector’s item that can provide a historical backdrop of the sport for future generations. You can buy you copy of the book here.